“Smart grid” is an umbrella term for high-tech upgrades to our power grid—the lines, wires, and power plants that deliver electricity to our doorstep. The system consists of one-way communication, in which electricity is generated and placed onto the power grid for our immediate consumption. A smart grid, however, is based on two-way communication, potentially allowing meters to automatically alert the utility of costly problems, and consumers to take advantage of optional pricing plans that could cut their costs. If done correctly, a modernized electric grid could save Illinois consumers billions of dollars by reducing power outages and cutting energy waste. What Exactly is a Digital Smart Meter? A typical electric meter has tiny mechanical dials that someone—you or a utility worker—has to read each month in order to measure a home’s power usage. There are no dials on a “smart meter.” It has a digital face, and unlike traditional meters, it can send—automatically and almost instantly—your power usage to the utility. The Energy Infrastructure and Modernization Act, or the “smart grid” bill, allows ComEd and Ameren to make $3.2 billion in upgrades to Illinois’ power grid and creates a new regulatory framework under which consumers pay for those upgrades. While CUB opposed the legislation, the consumer group’s job moving forward will be making sure customers receive the benefits of a modernized power grid—and not just the bill. 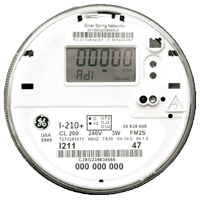 ComEd plans to install 4 million new digital electric meters across northern Illinois by 2018. Find the installation schedule here. By 2019, all of Ameren Illinois customers are scheduled to have new meters. See when and where meter upgrades will occur here. What are the Benefits of Illinois' Switch to Smart Grid? Eliminating Estimated Bills: Many people don’t know that the power company can delay reading the electric meter for months at a time and instead estimate a home’s usage. It’s one of the most common complaints that CUB receives: “The electric company underestimated my usage for months, and then slapped me with a huge make-up bill.” Smart meters will virtually eliminate estimated bills. Reducing Power Outages: With the old mechanical meters, power companies often don’t even know there is a blackout until customers notify them. Digital smart meters could alert the utility immediately about a power outage in your neighborhood, and in some cases, automatically fix the problem by rerouting power. Avoiding prolonged power outages could save Illinois consumers hundreds of millions of dollars. Improving Efficiency/Reliability: Electricity theft and powering vacant office space—extra costs that the utilities slap on all customers—could be more easily detected and prevented with smart meters. So could unaccounted energy—when customers move into a new home and use electricity before an account has been started. New pricing plans: Digital meters pave the way for creative pricing plans that can help consumers not only lower their bills, but reduce power prices for everyone. Even a small reduction in “peak demand”— electricity our nation’s homes and businesses devour at the busiest part of the day—would make a big diff erence on our power bills. 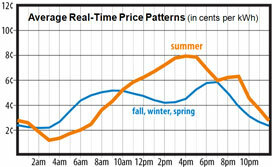 Standard Illinois electric rates charge most of us a rigid, fl at rate that gives consumers absolutely no fl exibility to take advantage of how cheap the market price for electricity is during “off -peak” times. But the new meters allow widespread participation in programs such as ComEd’s Hourly Pricing and Ameren’s Power Smart Pricing, which charge customers an hourly rate. Other optional programs made possible with the smart grid are ComEd’s Peak Time Savings and Ameren’s Peak Time Rewards, which give you a bill credit for shifting your electricity usage from peak to off -peak times. Will Smart Meters Give the Utility Control Over My Electric Usage? No. The smart grid is about giving customers—not the utility company—control over their power bills. Smart meters do not transmit personal identification information about customers, and they can’t identify—or control—the appliances you’re using. Plus, state law mandates that utilities, their contractors or agents, and any third party cannot sell a customer’s personal information, such as name, address, telephone number, and data about electricity usage. Yes. Digital meters use a low-power wireless radio to periodically communicate energy-usage information to the utility—typically just a few minutes a day. When they are transmitting, they emit low levels of “Radio Frequency,” or RF, just like other common household items, including radios, TVs, baby monitors and garage door openers. Decades of research—including reviews from the Vermont Department of Health, the Texas Public Utilities Commission (PUC) and the California Council on Science and Technology (CCST)—have found no scientific evidence that links health risks to the levels of RF emitted by smart meters. In fact, even if you stood in front of a smart meter for long periods of time, the RF levels would fall far below Federal Communications Commission (FCC) safety standards—typically 70 times less. At 10 feet away, research shows that a digital meter communicating with the utility emits less RF than a laptop computer, a microwave, a coffee shop with Wi-FI—and 300 times less RF than a typical cellphone. And unlike cellphones, you don’t hold a meter to your ear. The devices often are on the other side of a wall or tucked away in the basement. What is CUB's Stance on the Smart Grid? 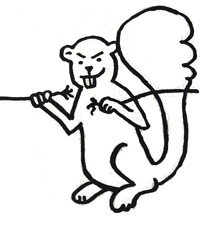 CUB opposed the law that funded the power grid upgrades, because it was concerned that consumers would pay too much to fund the improvements. However, it sees excellent potential consumer benefi ts from a smarter power grid. CUB’s mission is now to educate consumers about how they can benefi t from the upgrades and to act as a watchdog to make sure ComEd and Ameren live up to their promise and improve the power grid in a way that helps consumers.